Some of Spain's best surfing spots are situated in between Tarifa and Cadiz on the Costa de la Luz. Storms in the Atlantic ocean are causing the swell reaching the Spanish Atlantic coast. This is why the best months to find good waves are between October and May, when the stroms are more frequent. On good days you'll encounter waves up to 3m. The best days are when the Levante wind changes to Poniente wind and the water is going to be glassy. Windless days are rare, but always better for the wave conditions. Most surfers in Tarifa stay on the city beach Los Lances, on the right side of the Isla La Paloma. The swell usually gets forced into this corner of the bay and breaks smoothly in a proper beach break. These waves are not very high, but they're great for learning and improving your skills. Rising tide is the best time to go surfing here. Parking is no problem along the beach promenade. Another great spot is next to the Hurricane Hotel within the bay, when the waves are too chaotic at Playa Los Lances. The rocky ground in the water makes the wave break earlier. At low tide it's possible that the stones stick out of the water, so we recommend to go here at higher tide. Park your car directly at the spot at the Club Mistral surf station on the left side of the Hurricane Hotel. The Punta Paloma is situated at the right end of the Tarifa bay, where the large sand dune is. It never gets crowded here. The Spanish call this spot also Benavides. Even the way to this beach is a nice experience. Take the little path from the public parking behind the dune through the pine woods and cross some smaller sand dunes until you see this liitle beach with stones in the water on the left and right. In between these rocks is where the waves break perfectly on days with a bit a bit of southern swell. El Palmar is the beach with the most surfable days in the year. It's situated about 60km from Tarifa further up the Costa de la Luz. 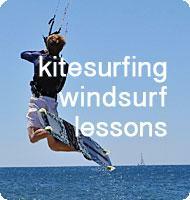 Some surf schools offer beginners courses and rent the surf material. Andalusia's epicenter of surfing is El Palmar, it attracts locals from near and far, especially at the weekends. But the beach is long enough for everyone and peaks are plenty at this beach break. We recommend to surf El Palmar preferebly with lower tides. That's when it works best and provides waves about shoulder high. Another great spot is Caños de Meca , about 8km in the south of El Palmar. The waves breaks 70m from the shore at a reef right infront of the touristric urbanisation "Playa del Estrecho". Stones make the entrance to the water a bit difficult here. Cuts in your feet will be unavoidable, unless you wear neoprene shoes. This wave can be the longest ride on good days when the swell direction is perfect. "The Costa de la Luz is an easy-to-reach winter surf trip recommendation"